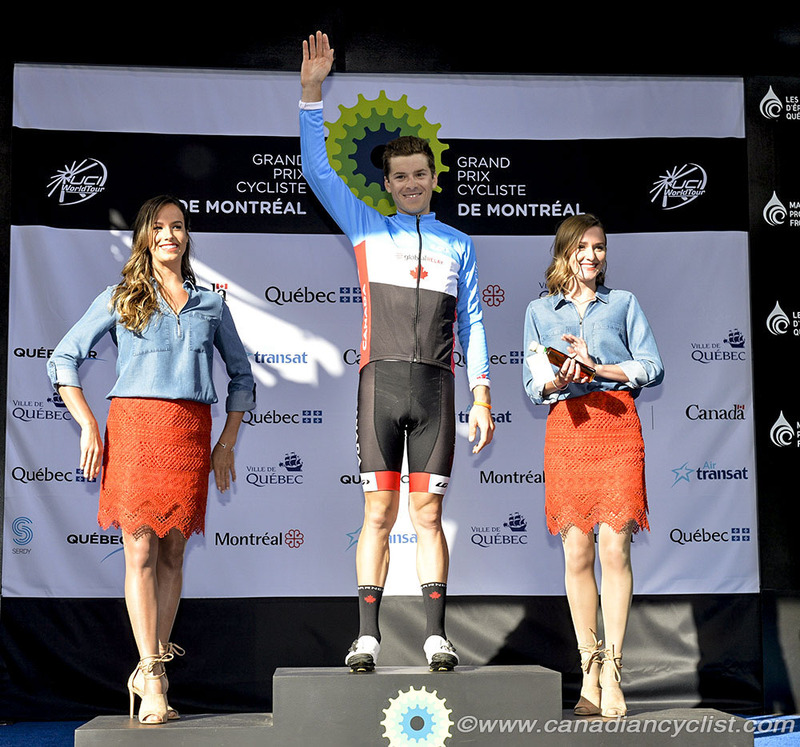 Team Canada's Ben Perry of St Catharines, Ontario, won the King of Mountain competition at Sunday's WorldTour race in Montreal. 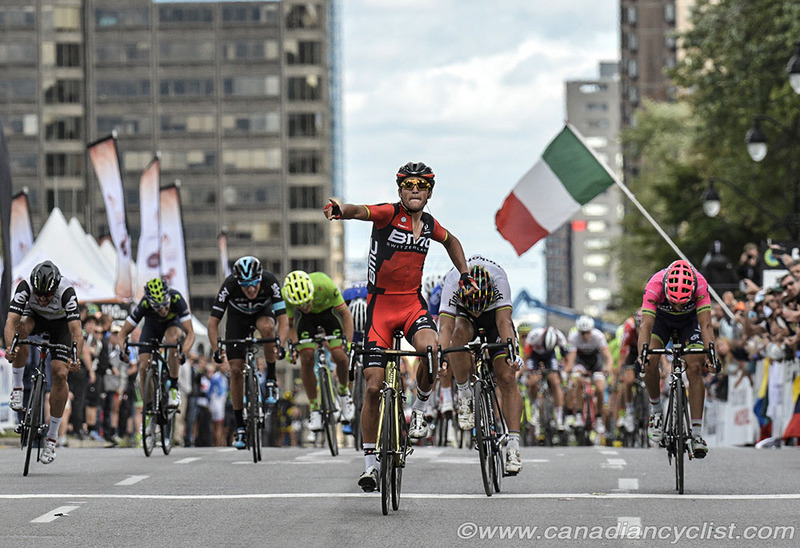 Perry and Matteo Dal-Cin of Ottawa were in a breakaway that spent nearly 200 kilometres at the front of the race. 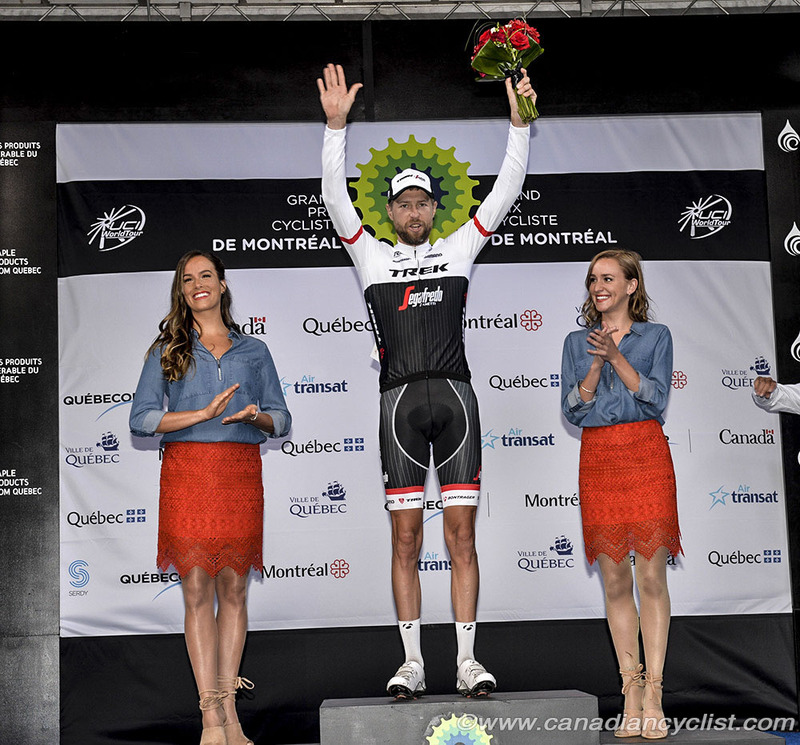 Ryder Hesjedal (Trek Segafredo) was the top Canadian finisher, in 19th place. Olympic champion Greg van Avermaet (BMC) of Belgium won the 205.7 kilometre race by outsprinting world champion Peter Sagan (Tinkoff) of Slovakia, a reversal of the results from two days ago in Quebec City. 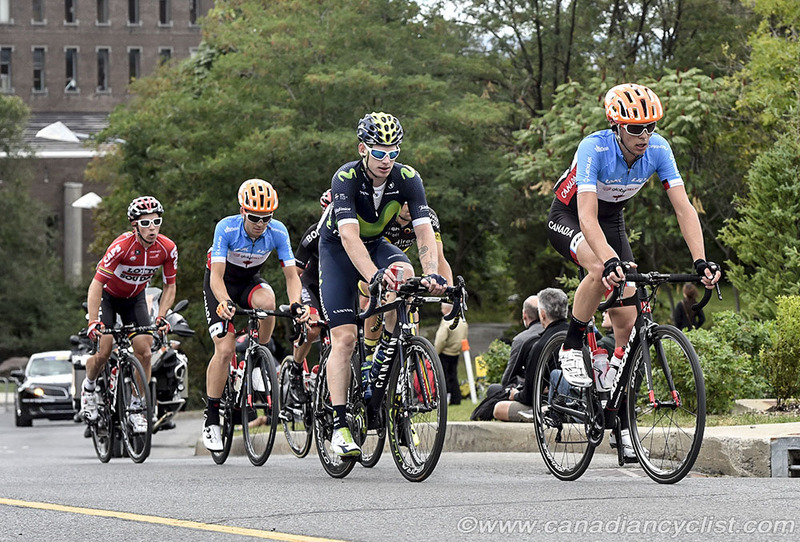 Perry and Dal-Cin were members of a six rider breakaway that formed in the first couple of kilometres of the Grand Prix Cycliste de Montreal. The break also contained Fabien Grellier (Team Direct Energie), Lukas Pöstlberger (Bora-Argon 18), Sean De Bie (Lotto Soudal) and Jasha Sütterlin (Movistar Team). Perry went for KoM points over the top of the course climb on each designated lap to lock up the title. The gap grew to over six minutes before the other teams began to chase, led by Sagan's Tinkoff squad. Lampre and Sky were the next to move the front as the break disintegrated under the pressure, with Grellier, Perry and Pöstlberger the last to get caught with two laps remaining in the 17 lap event. "It was a really long time off the front," agreed Perry. "A guy from Bora-Argon 18 went and I followed him, and then Matteo caught us and eventually there were six of us. Kevin [Field] our director thought it was more realistic for us to play our cards in the long shot odds of a breakaway, and also go for the KoM. I was the first one to get a [KoM] point, after that Matteo rode like an absolute tank the whole day, keeping me safe, and he's the reason we probably stayed away a lap longer than we would have otherwise, so it's due to him that I made it. I haven't done many races over 200K in my life and we were away for all but about 20 kilometres of the race. I'm happy that I proved I could do it and stay out so long on such a hilly race, for me that means a lot." 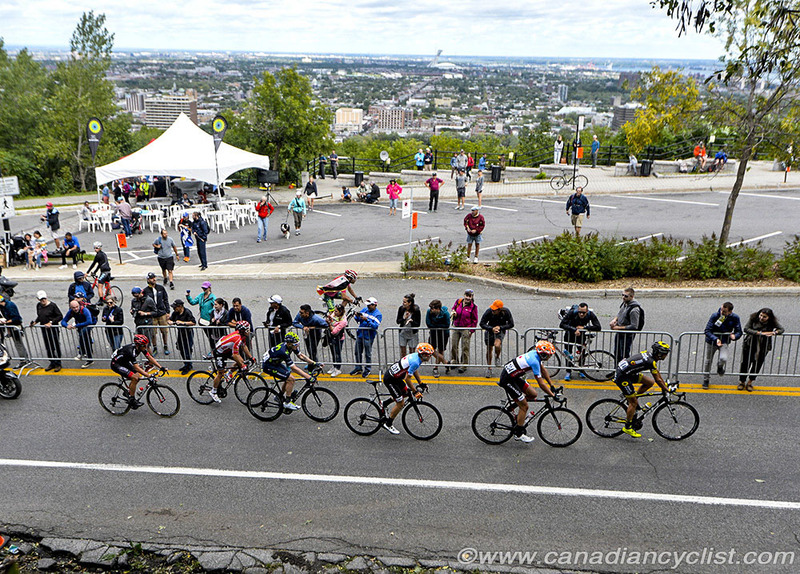 Another group then attempted to break clear, including local favorite Hugo Houle and his AG2R team mate Cyril Gautier, plus 2010 Grand Prix Cycliste de Québec winner Thomas Voeckler (Direct Energie). But the peloton regrouped again going into the last lap. The big battle started on the last ascent of Camilien-Houde when Hesjedal, Romain Bardet (AG2R La Mondiale) and Rui Costa (Lampre-Merida) attacked in turn. Costa, the 2011 winner, took his rivals off guard with a counterattack, and led on his own for the last five kilometres before being reeled in shortly in the final kilometre. Sagan led the chase, after no one was willing to pull him up to Costa. 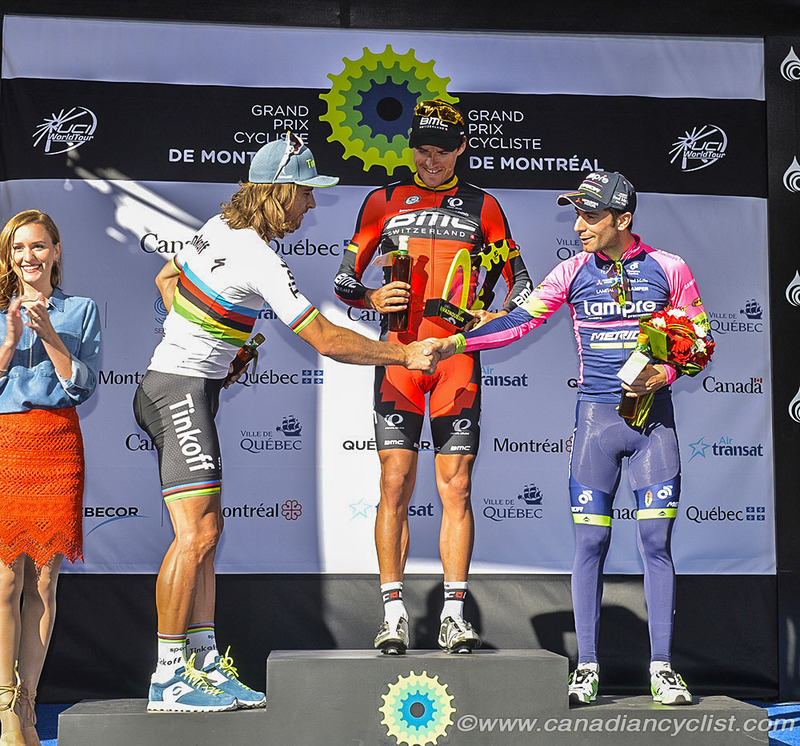 Alberto Bettiol (Cannondale-Drapac) tried to launch the sprint early, but van Avermaet bided his time on the long uphill finish, and powered his way to victory after three previous podiums in Canada. Sagan made his effort to come off van Avermaet's wheel a little bit too late and had to be content with second place ahead of Diego Ulissi (Lampre-Merida) and Australia's Michael Matthews (Orica-BikeExchange). "I have come here many times and had not managed to win yet," commented van Avermaet. "I'm very happy I've done it. We worked very hard with Alaphilippe and Vakoc in the finale to try and catch Rui Costa and I'm glad we made it so that I could have my chance to go for the win. It's been an incredible year. For many years I was the guy who didn't quite make it and now I've won all those great races. I hope I can continue like this and win races like Flanders or Paris-Roubaix. It's sure that Peter and I have responsibilities as the world champion and Olympic champion and I'm sure we will continue to do our best in the years to come." Sagan said, "I'm happy. First in Quebec and second in Montreal is not bad. What happened? I was just tired. I had cramps in the final sprint and I could not sprint better so I'm content with my second place."